Clooney, Roberts, Foster caught in Wall Street panic. Directed by Jodie Foster. With George Clooney and Julia Roberts. Now playing. 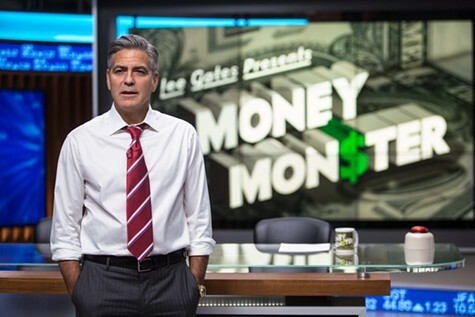 In Money Monster, George Clooney plays Lee Gates, the host of a TV show with the same title. It’s a cable news entertainment rigged up as a slapstick financial report, with Gates in funny hats loudly making fun of whatever disaster is taking place on Wall Street that day. One of the movie’s labored ironies is that no matter how ridiculous Gates acts, audiences take his advice seriously and act on his recommendations. One of the show’s viewers, a distraught working stiff named Kyle (Jack O’Connell), lost his family’s life savings when he bought one of Lee’s stock picks, and so he shows up in the studio one day while the show is taping, storms onto the set with a handgun and an explosive vest, takes Lee hostage, and demands $800 million. Matters are further complicated by the fact that the CEO of the company in question has mysteriously disappeared on a trip overseas, presumably with the all the money. Now it’s up to Lee and the show’s producer, Patty (Julia Roberts), to somehow defuse the situation, which is playing out live on the air, with millions watching. The germ of the screenplay — by Jamie Linden, Alan DiFiore, and Jim Kouf — is interesting in an obvious way. Ordinary people are at the mercy of predatory financial corporations whose misdeeds are seldom punished, and every once in a while someone like Kyle explodes from frustration. Lee and Patty share in the guilt as enablers, however silly their show is. But neither the writers nor director Jodie Foster know what to do with that narrative germ. Pale jokes give way to pathetic implausibility, and the tense situation is padded out to its limits, with Clooney and Roberts performing as if they were wrapped in cotton, with mousy dialogue and zero suspense. Unsurprisingly, the audience at the preview screening laughed at poor Kyle’s helpless rebellion — what else could they do with such a clumsy farce? For all its righteous indignation at liars and cheaters, the movie tries to pull off a swindle of its own. It’s a flabby, poorly constructed, fake-important, “topical” dessert dish, a paycheck sundae with a cherry on top for its two seen-better-days lead actors. In fact, they’ve probably seen better writing in the menus of whatever restaurant they dined at last night. We’re not buying Money Monster, not even at a discount.